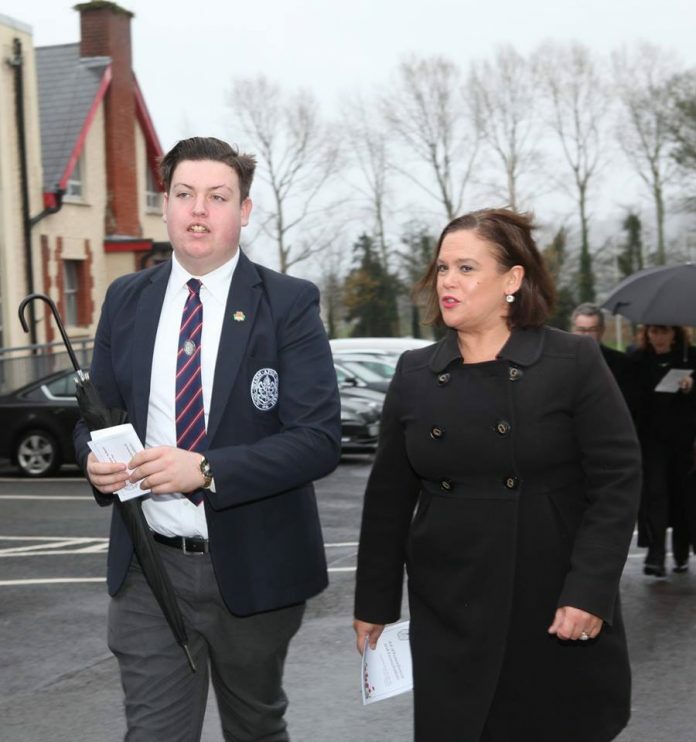 Sinn Fein leader Mary Lou McDonald yesterday, Wednesday, attended an event in Sligo to the centenary of the end of the First World War. She was one of a number of dignatries, local politicians and staff and students from Sligo Grammar School who attended a special act of Remembrance and Reconciliation at Calry Church of Ireland church on The Mall. The event was organised by the Grammar School to mark 100 years since the end of the First World War and is the fourth year a similar service has been organised by the school. Also attending the service were Lord Lieutenant for County Fermanagh, Viscount Brookeborough and German Ambassador to Ireland Frau Deike Potzel, who with Deputy McDonald all laid wreaths as part of the ceremony. Deputy McDonald laid a wreath on behalf of Irish soldiers killed in the war while Viscount Brookeborough laid a wreath on behalf of Allied soldiers and the German Ambassador on behalf of all soldiers. President of the Royal British Legion, Midlands Counties and Kildare Branch, David Gibson-Brabazon and Paul Stephenson laid a wreath for the Royal British Legion, Republic of Ireland. Members of the Defence Forces, the United Nations Veterans Association and the gardai, as well as staff members and pupils from Sligo Grammar School also laid wreaths. Dean of Elphin, Afron Williams led the ceremony and a two minute period of silence was observed in memory of the fallen. The act of Remembrance and Reconciliation was followed by a tree planting ceremony. Deputy McDonald spoke to the Sligo Weekender about the significance that events such as these have in bringing people together. “I was delighted to be invited by Sligo Grammar School and it was a very inclusive event. The theme of reconciliation and commonality was best underscored by the telling of the story of Winifred Carney who would have been one of James Connolly’s closest associates and her friendship, love and marriage to George McBride [a unionist] and their maintaining of their position and integrity and yet living a happy life and marriage together,” Deputy McDonald said.